Just back from a busy week in New Orleans, where I had the chance to speak to many prospects and current clients. The biggest time and attendance pain point buzz for potential new clients at the trade show was “buddy punching”. Buddy Punching is a workforce management industry specific term that refers to fellow employees punching in-out of work for each other. Buddy Punching can be an extremely frustrating issue for employers. According to the APA, over 75% of companies in the United States lose money to buddy punching. Buddy punching amounts to theft of time from an employer. In the end its effects reach everyone; employers, employees and consumers. The consequences for buddy punching are numerous. On a basic level, it amounts to fraud. Punching a time clock for someone who physically is not present or using their credentials to punch them in is a deliberate criminal act involving two complicit employees. End result is employees end up being paid for work that they did not do, and are in effect mis-representing their attendance at the workplace. The absent employee benefits by receiving pay for work not done. Co –workers have to fill the gap for the missing employee. And the employer is paying out for ghost work. If you stop and think about buddy punching, the ramifications are much deeper than a larger paycheck. 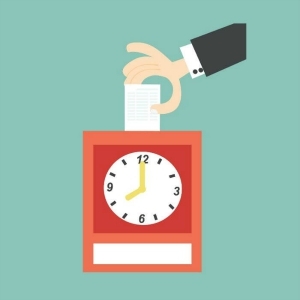 What if the stolen time pushes the employee timecard into overtime? That’s more money out the door for the employer. What if the time worked credits towards accruals such as paid time off? What if the absent employee has special certifications and is supposed to supervise part of a business process? For employers, if your employee is not onsite, what are they up to? Fraudulent time entries are factored into job costing. Job costing is used to figure margins and cost of goods. We as consumers end up taking the hit for the buddy punch. At the end of the day, buddy punching ends up costing all of us. When you are billing for services you don’t want to misrepresent the work that has taken place. Unseen buddy punching can put your company at risk for a costly, time consuming lawsuit and audit. There are several steps an employer can take to curtail buddy punching. First, make it clear in any employee manuals that buddy punching is unacceptable and outline the consequences of buddy punching. When issuing badges or key fobs make sure that your employees sign off on an appropriate and permissible usage form for their entry devices. Also make sure that employees can safely report witnessing buddy punching violations. Placing time clocks in open visible areas can help as well. We have even seen time clocks with video monitors and warning signs against buddy punching and credential sharing. Second, think about implementing a biometric time and attendance system. Biometric systems use our own completely unique human characteristics –hand shape, fingerprints, face geometry, etc. to verify a person’s identity. A biometric system would require the actual employee to be present to punch in-out of work. Biometric systems are an affordable and easy to implement solution to fight buddy punching and prevent the issue from ever happening. In addition, biometric time entry device technology has advanced greatly over the years. Employee authentication is now a fast and efficient process that can integrate easily into the workplace. You can find out more about Biometric clocks here. Buddy punching is a serious issue, and it’s our job as employers to manage our workforce in a smart and efficient way. As business owners, being aware that this issue is pervasive throughout all workplaces is a first step to putting a stop to this fraudulent activity. Do your best to help your business’ bottom line by preventing workplace buddy punching.